If you were in Tokyo in the late 1990s and you liked to party, you went there. Towering over six floors and holding over 1,500 people, Velfarre was a legendary Roppongi club that claimed to be the biggest of its kind in Asia. Pumping out cheesy Eurobeat, the club fuelled techno dance trends and was apparently where pop queen Ayumi Hamasaki met her future producer. The club was the stuff of legends, but unfortunately legends don't pay the bills and Velfarre closed its doors in 2006. Starting this month, the club is making a comeback, thanks to the Nico Nico Douga, Japan's answer to YouTube and a breeding ground for otaku memes and trolls. Nico Nico Douga differentiates itself from YouTube with its overlaid user comments. The comments, which can be turned off, flood the screen, blurring the lines between watching clips and reading funny, snide comments. Nicofarre takes that and combines it with Velfarre. The newly resurrected club is located in Valfarre's old spot, but isn't as large as the old Velfarre. What it lacks in size, it makes up with digital pyrotechnics. As blog Asajin points out, Nicofarre has five LED wallscreens that can project comments into the crowd. That is, people can comment during a concert, and said comment should appear on a screen in the club. The club also uses AR tech too, for example, film someone with an AR camera pretending to shoot a kamehameha, which is then realistically reproduced on a wallscreen. The ability for virtual characters to appear on stage opens up the door for virtual idols—and the inevitable beam saber fights. Is This Girl Real or Virtual? Nicofarre also showed off Vocaloid virtual idol Gumi of Megpoid software on stage and on the LED screens. 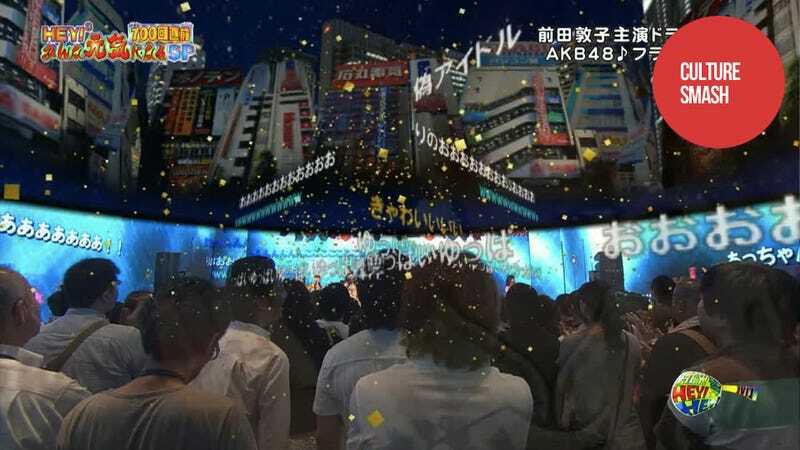 On Monday AKB48, Japan's most popular girl group, graced the stage at Nicofarre for a televised special. And the ability to comment and have one's comment for all to see in the club—and in this case television as well—brought out the inevitable trolls. There seems to be a filter catching certain words, preventing people from just writing bad words. Not all words are bad per se, and "clean" words can still do competent trolling. As bulletin board 2ch pointed out, on the TV broadcast, 偽アイドル, or "phony idol" wasn't caught by any filters and was broadcast behind AKB48 live on primetime TV.